Spring has sprung! 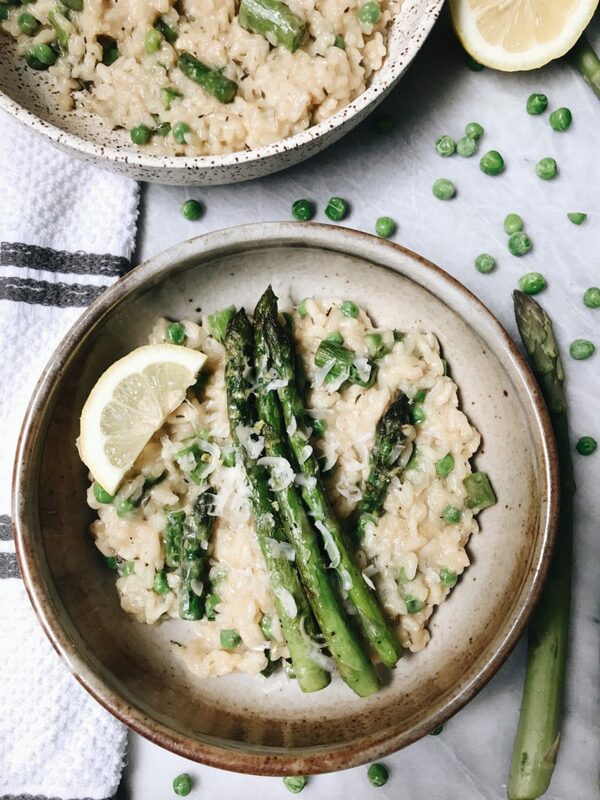 Check out this delicious lemon asparagus risotto with peas. I absolutely love risotto. While it does take a lot of attention to make, the outcome is always worth it. 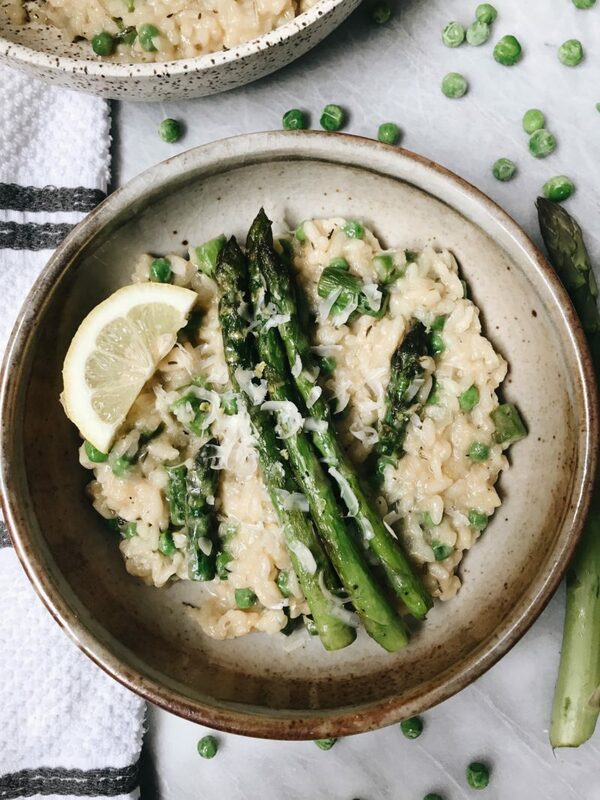 I have a couple of other risotto recipes on my blog, but I wanted to make one inspired by Spring/Summer. The last two times I went to Trader Joe’s there has been an endless amount of asparagus. They looked so beautiful so I have picked a bunch up every time I have been in there. I have been working on an air fried veggie post (coming soon, still have a few veggies left to conquer), but I also wanted to try something different! Before I went Vegan I would go to an Italian place often which had this lemon zest asparagus pasta. 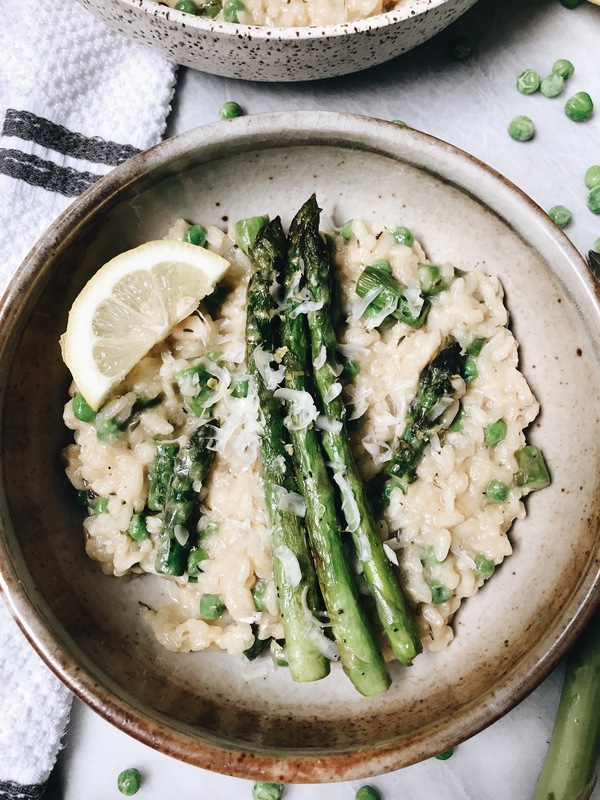 This recipe is inspired by that dish but I wanted to replace the pasta and make it into a risotto. As pictured above, I garnished this dish with some vegan parmesan. I used the Violife block and I think it’s so crazy how it’s shaped like an actual block of parmesan. This recipe just Spring/Summer to me! The asparagus, peas, and the lemon is just so tasty. All the flavors mixed together just makes the dish. Also, the creaminess of the risotto helps too! I hope that you enjoy this recipe! If you make any of my recipes, don’t forget to tag me in the picture @plantbasedjane so I can see! Begin by cooking you're asparagus. Cut into bite sized pieces (you can leave some whole for topping as I did) and cook in a pan on medium heat with your olive oil & salt/pepper. Cook for 3-4 minutes and remove from pan onto a plate. Heat up a large pot on medium heat and melt your butter. Add in your shallots and allow to cook for 2-3 minutes. Add in your garlic and stir for another 30 seconds. Add in your rice, dried spices & lemon zest. Stir continuously until the rice has a glossy finish. Add in your first cup of vegetable broth. Stir continuously until the broth has absorbed into the rice. Repeat process with your remaining 3 cups of broth until all the liquid has been absorbed. Once the rice has absorbed all the vegetable broth add in your nutritional yeast, peas & lemon juice. Salt and pepper to taste.